Since I finally went grocery shopping the other day, it was high time to come up with something a little more creative. F&B have been playing a Veggietales game pretty frequently, and Bob & Larry seem to be nice and oval-ish to create. I had the kiddos bring me some pictures and we got to work. 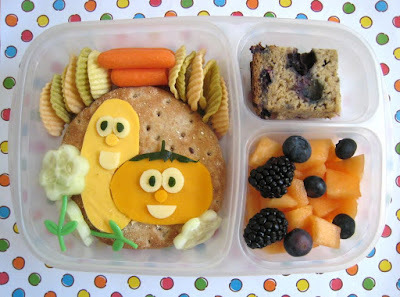 Faith has a turkey & cheese sandwich on multigrain sandwich rounds, topped with VeggieTales decorations. Bob (he's a tomato for those of you who don't want VeggieTales) is made out of orange cheddar with white cheddar and cucumber accents, while Larry (a cucumber) is made out of lighter orange cheese with white cheddar and cucumber accents. To keep with our VeggieTales theme, there are cucumber flowers, carrot sticks and some yummy veggie chips. To the right, there's cantaloupe, blueberries, blackberries, and a bit of my homemade blueberry-banana bread. It's packed in one of our Easy Lunchboxes, which in turn is packed in the matching cooler. As for Mr. Ben? He's sitting at the kitchen table, drawing the VeggieTales characters and singing, rather loudly, "God is bigger than the boogeyman". He amuses me. That is seriously the cutest thing I've seen in a very long time. So cute! And do they all stay together in the lunch box, or do they fall apart? I've often wondered that. Haha, cute! My daughter would love that! Good job! What cutters do you use for your cucumber flowers? Mine are not my favorite. adorable! we LOVE veggie tales here. what a great idea! "He's bigger than Godzilla or the monsters on TV!" Cute! I saw another VT bento this week... Larry was made out of a cucumber! Very cute. Where did you get the picks that look like stems? @Karen, teeny tiny dots of plain cream cheese on the back hold it in place. And Faith is pretty careful anyhow. @Mariah, a bento friend sent me the picks from a bigger Japanese store. The pack had flower stems, balloon stems, rings, little bones, and umbrella handles! I love your cucumber and tomato. JDaniel loves to watch these videos. My 3-yr old daughter just watched "Where is God when I'm scared" this morning, as she has every morning for the last 2-3 weeks. She loves the movie! That's terrific! I'm very impressed by your Bob and Larry renderings. My daughter is only two and her daycare provides lunches, so I'm not bento-ing yet, but I'm really excited to start. I'm very much enjoying your blog. Thank you for sharing your creations! So cute. I love it!! Do you use cookie cutters to make the shapes? My kids love Veggie Tales, and that song is one of their favorites! I love this idea!